My love for agaves is no secret. They're eye candy, they have a don't-mess-with-me attitude, and no matter where you put them—in the ground or in a pot—they make a statement that cannot be denied. Unlike perennials, which flower over and over again, virtually all agave species flower only once. They literally put all they've got into producing that one flower stalk. Even in a small agave like the Agave utahensis var. nevadensis above, the inflorescence is very tall in relation to the body of the agave. The flower stalk began to emerge in early March. By late April it had reached its final size, and in the third week of May the flowers started to open up. A mini heat wave really sped up the flowering. 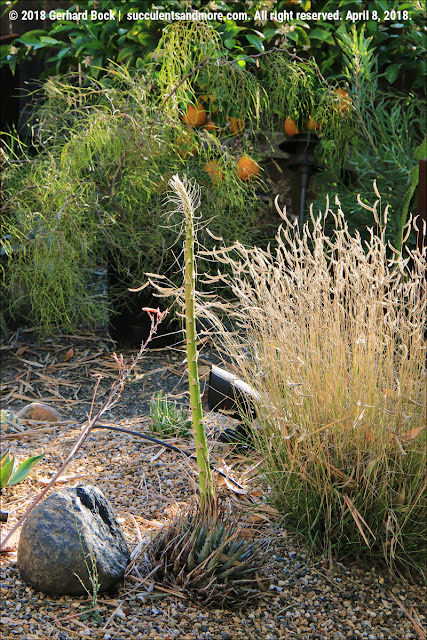 I sent the top section of the flower stalk (on the right in the next photo) to Hans Hansen of Walters Gardens. He is the brilliant mastermind behind their mangave program, and he wanted to harvest the pollen of my utahensis for future hybrids. I think a mangave with the spines of Agave utahensis would be very cool! The Agave schidigera near the front door is sending up a flower stalk, too. I bought in 2010 at the UC Berkeley Botanical Garden, and it's always been a favorite of mine. I have no idea how much taller the flower stalk will get. 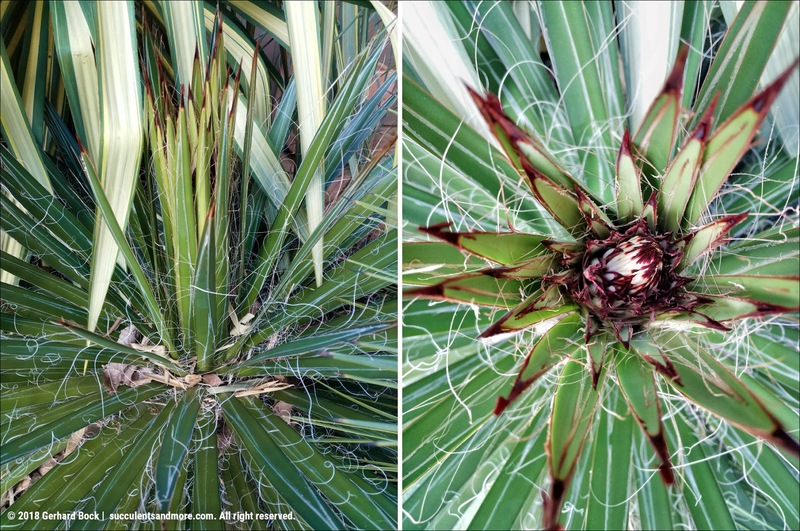 In his book Agaves: Living Sculptures for Landscapes and Containers, Greg Starr says 12-15 ft. The flowers will be a reddish hue (reddish yellow to deep red). Like I did with Agave utahensis var. nevadensis, I'll send a section of the inflorescence with unopened flowers to Hans Hansen for use in his mangave work. Maybe he'll be able to create a mangave with curly hairs! How exciting to think you might be instrumental in a new Mangave cultivar ! Obviously it will have to be named after you. Well, all I did was overnight the pollen. Others are doing all the work. I want to buy the mangave you helped to create! How cool to be able to share seeds for such a fun endeavor! I know! Even my little agave was glad to be serving a purpose :-). BTW, check out all the cool mangaves Walters Gardens has. Most of them are available through Plant Delights. You've turned a negative into a positive! 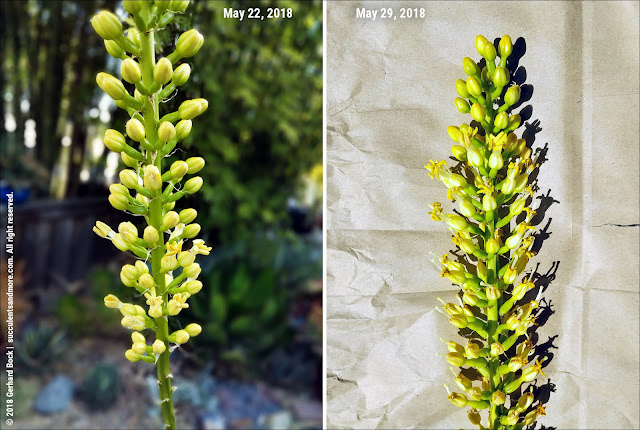 I've yet to have a single agave bloom but I have visions (well, really nightmares) of them all doing that at once. It's bittersweet for sure, especially if it's one you really liked. But I look at it as an opportunity for planting something new. 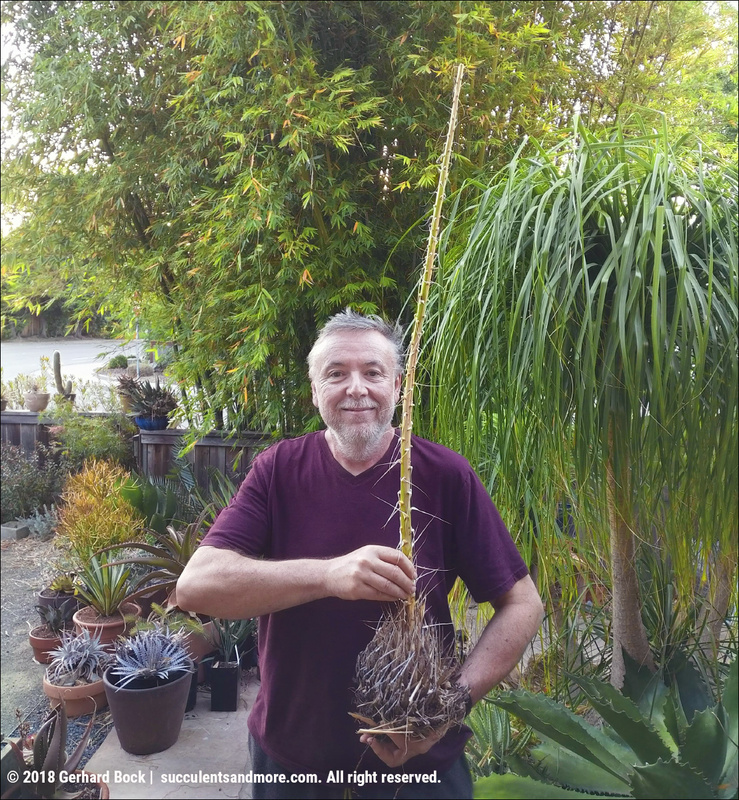 As you can see in the photo of me holding the carcass of Agave utahensis, it's already gone. Its spot is now occupied by a ×Mangave 'Red Wing'. Five of my 6 Blue Glow agaves are currently blooming. They started pushing up flowering stalks in mid-December and are just about finished blooming. They are favorites and I will miss them. Three Agave mitis (sold to me as Agave celsii "Nova") bloomed last year with single stalks. 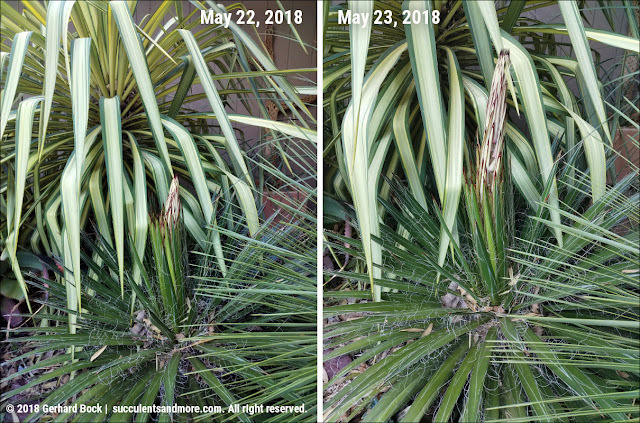 The plants remained healthy looking so I left them in place and 2 of them have pushed up multiple, shorter bloom stalks - 8 on one plant, 11 on the other. Once all that's over with, I'm going to have a lot of empty space! Luckily many Agave pup off so the spot in the garden they encompassed can continue to have agave at various stages of maturity. Some don't make any pups at all though I guess. Some seem to pup off the inflorescence when the bloom spike occurs as well! 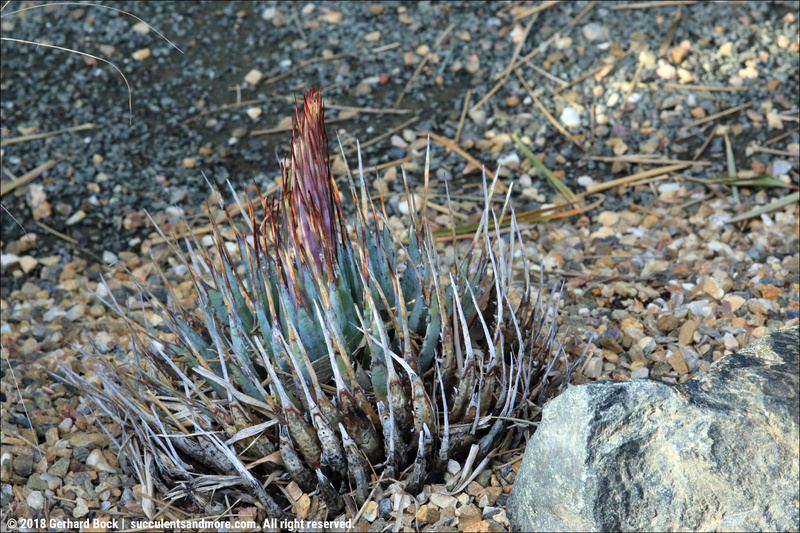 There is an Agave montana currently blooming at the Ruth Bancroft Garden I heard. Stunning red flowers, not one to miss! I would love to find some A. montana plants to purchase somewhere. I hope they can develop a new plant or two, maybe they’ll ask you to name them! I love that photo of you with the remains of the A. utahensis...it's fab!